According to the Gita, when you go into the protection of God once, there will be welfare and there will be no destruction. The Gita had always been the welfare of the human being, and it will remain. Its verses are also present in today's context, with the ability to solve all the problems of the whole world. The Bhagavad Gita has been considered one of the most important scriptures of Hindus for over 2000 years. The scripture is almost universally regarded by Hindus as the epitome of all the spiritual teachings of the Vedas and the Upanishads and is read by millions of Hindus for inspiration and solace to this day. Many Hindus memorize all of its 700 verses or at least selected chapters and verses to draw upon their teachings and to teach others. Many Hindus believe that if you study and understand the Gita, then there is not much need to read the hundreds of other scriptures that we have. The importance of the Bhagavad Gita is indicated in the Hindu tradition by several popular verses, one of which says that whosoever seeks recourse to Gita, Ganga, Gāyatrī and Govinda – the 4 Gs, is freed of the cycle of birth and death. Another verse states that all the Upanishads are cows, and Lord Krishna is the milkman who has extracted their teaching in the form of the milk of Bhagavad Gita. There are many Life lessons which Bhagavad Gita teaches us like develop the right perspective, understand that change is the law of nature, practice tolerance and forgiveness, change the way you think, stay calm, Work for the welfare of the world, Be fearless, Manage your anger, Accept that nothing is permanent. 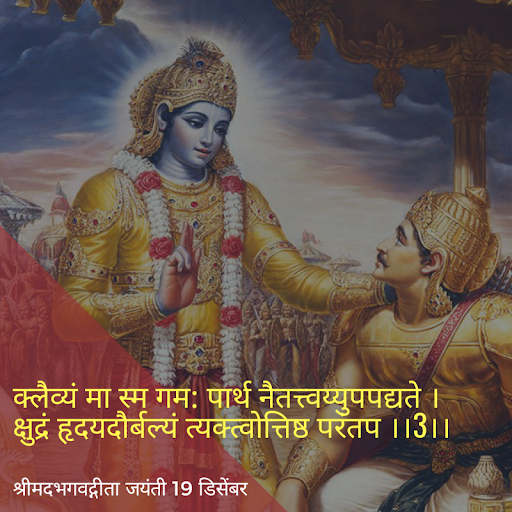 So on this day of Gita Jayanti, we make a resolution of accepting values of Bhagavad Gita in our lives.